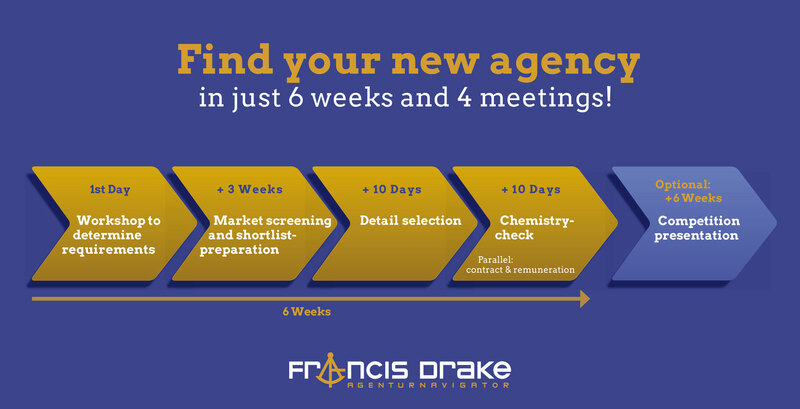 Find your new agency in just 6 weeks and 4 meetings! We offer you extensive industry experience and know the German advertising agency market like the back of our hand. With us, you will learn what really makes agencies tick and gain important insights and key knowledge advantages. We will help you find ‘your’ agency from the immense torrent of advertising agencies and communications service providers that come in all shapes and sizes – regardless of whether you need a specialist or generalist. From the exciting spin-off to the international network agency. For every industry. And with just the perfect amount of digitalisation that is right for you. Our modular and customisable approach to an agency selection process provides you with a tried and tested framework, which allows us to cater to your specific requirements, objectives and challenges in a customised format. In some cases, however, a subsequent pitch presentation is also useful or indispensable. This way you also get our support, advice and organisation as with other decision-making formats, such as challenge projects , immersion workshops and completely unique solutions . We keep all stakeholders (including international ones) on the same page throughout the entire process. We merge all aspects and requirements as well as different levels of expertise in a uniform process and take on all reconciliation and coordination efforts required for this purpose. After each process step, we prepare an audit-proof document describing the current project status, which is coordinated with all decision-makers. By hiring us, you receive the complete market overview and save yourself a lot of valuable time as well as costs, which you can dedicate to other important tasks. You can rest assured that we take a completely neutral and objective approach in all that we do, since we are only paid by our customers – companies putting out advertising – and have no business ties with advertising agencies.